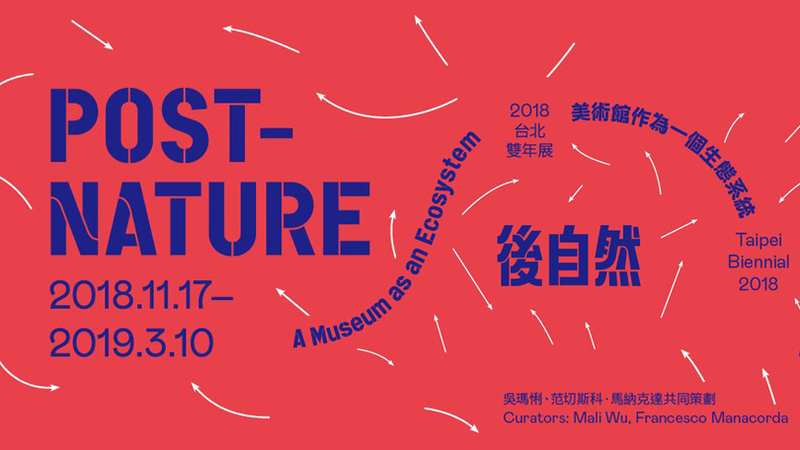 The 11th edition of Taipei Biennial 2018, 《Post-Nature—A Museum as an Ecosystem》 takes place at Taipei Fine Arts Museum from 17 NOV 2018 to 10 MAR 2019. Co-curated by Mali Wu and Francesco Manacorda, the Biennial focuses on the interconnectivity of ecosystemic structures formed between humans and nature and aims to serve as a platform for social experimentation, generating new interdisciplinary possibilities for long-lasting, community-driven, bottom-up synergies. While the exhibition venue, Taipei Fine Arts Museum, act as the Biennial’s central nervous system, the experimental methodology of this exhibition will transform the museum into a platform for multi-disciplinary discussion, which intends to extend outward and reach multilateral resonance outside of the museum’s architectural limits. In the Biennial, the museum is reconsidered as a social model. Exhibitions grow quickly, occupy a limited time span, and have little ability to sustain their reach, while museums develop slowly and organically, responding carefully to their environments and preserve their own longevity. The curators mention, if too rigidly confined by an architectural and conceptual framework, a museum can become an isolated space for art contemplation, rather than remain open to constant ecosystemic transformation, osmosis and growth. This Biennial aims to investigate how museum as an institution exists as, and within, a social, cultural, economic and political ecosystem.